Spin and the University Tour Guides. Since then theTuesday club has met each Tuesday morning to provide a service to the University of Strathclyde. Their work is co-ordinated by a University member of staff and any department can ask for assistance with mailing. Over the years many departments have been grateful for this free service. At present members number about ten. On 24th July 2011 Marion Rankine, a founder member of the Tuesday Club passed away. became the first Treasurer of the 3Ls. 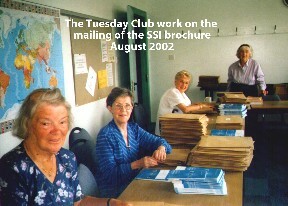 Apart from being a popular and active member of the Tuesday Club until shortly before she died, Marion had also been a keen member of the Bridge and German Clubs and also an enthusiastic member of the Music and Computer Clubs. Marion enjoyed her long association with the University and had attended various classes in her thirst for knowledge.